Chorley’s ex-loan star Marcus Carver has rejected a new deal at League Two club Accrington Stanley to return to Victory Park. The 22-year-old striker’s contract at Stanley is up on July 1 and he has signed a pre-contract agreement to join the National League North side on a permanent deal. Carver had a three-month loan spell at the Magpies at the start of last season and made 11 starts and eight substitute appearances, netting twice against Nuneaton Town and Hednesford Town before returning to the Crown Ground. A product of Stanley’s youth system, Carver shot to prominence in the youth team in the 2011/12 season and then shone during loan spells with Marine, Halifax Town and Barrow but still made 44 appearances for Stanley in the full-time game, netting four times. A spokesman for Chorley said that, despite Carver being under the age of 24, Chorley will not have to pay Stanley a fee or compensation to sign the forward. 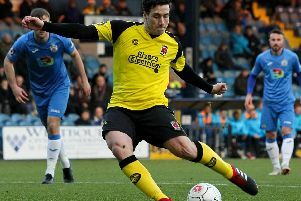 Carver becomes Chorley boss Matt Jansen’s seventh signing this summer following the arrivals of Matt Challoner and Adam Blakeman from Southport, Scott Leather and Josh O’Keefe from Altrincham, Stephen Jordan from Fleetwood Town and Sefton Gonzalez from Clitheroe.